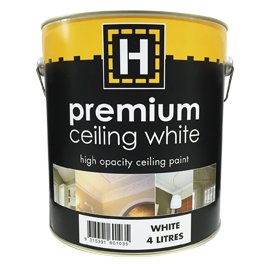 H-brand premium ceiling white is a premium quality, extra white, heavy bodied, high opacity architectural paint specially formulated to reduce drip and spatter during application. It has an ultra flat finish thus hiding small imperfections in ceilings. Sizes 500 mL, 1 Litre, 4 Litre, 10 Litre and 15 Litre.